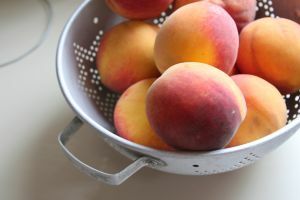 The best fresh peach recipes, including peach crisp recipes, peach schnapps recipe, recipe for peach pie, fresh peach cobbler and peach tart recipe. There is nothing better then using fresh peaches in your favorite recipe. Here are some great fresh peach recipes to keep you cooking well into fall. Preheat oven to 375F. Use a buttered or non-stick coated 8 inch pie dish. Slice peeled, pitted peaches into the prepared baking dish. Sift together the flour, sugar, salt and cinnamon into a medium bowl. Using a pastry blender cut the butter into the flour mixture until mixture resembles coarse meal. Sprinkle the mixture evenly over peaches in baking dish. Bake at 375F for 45 to 50 minutes, until topping is golden brown and peaches are tender. Make sure to serve warm and add a bit of whipped cream for an extra sweet treat. Peel 12 medium size peaches (much easier to do if you dip in boiling water for about 30 seconds and then immediately stick in cool water. Put both the peaches and pits in a glass jar with tight-fitting lid. Let sit at room temperature in a dark area for 1-2 months shaking lightly and tasting every couple of weeks. Strain the mixture into a glass with tight-fitting lid. Store in a dark, room temperature place for at least 1 month before serving. Serve at room temperature, closing the bottle tightly between servings.